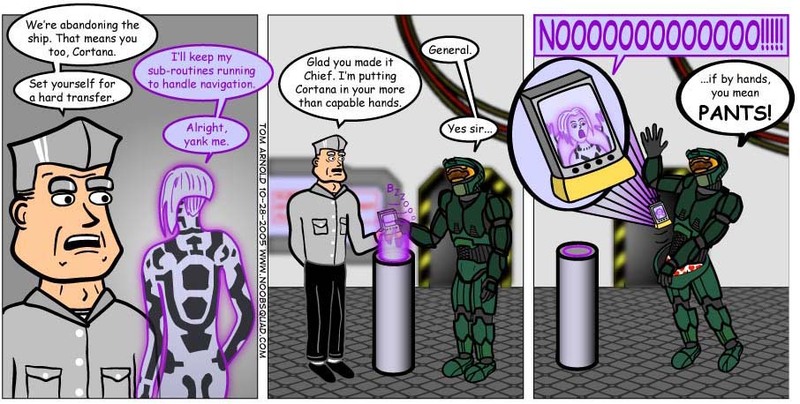 n00b squad - "More than capable alright"
I thought of this comic back when rumors started floating around about a Halo character being in Dead or Alive 4. Everyone, including myself, thought that it would be Cortana since she’s the most “qualified” female character. And then what would the always charming Master Chief do? Well, I believe this comic answers that. It turns out that there will be female Spartans in the game, which is unfortunate and confusing at the same time. Good ol’ Andre told me to get Far Cry Instincts because “Far Cry Instincts rocks!” His argument for this was so compelling that I went out and bought Geist, a totally different FPS, for Gamecube. Muhahahahahahahaha, how ironic! Fortunately, I haven’t seen any enemies try to call Ghostbusters in that game.